THE MPAAretracted the findings of a study it used to push for anti-file-sharing legislation since 2005. The Association had consistently claimed that 44% of the movie industry’s domestic losses were caused by illegal downloading of movies on college campuses. However, the true number was actually 15%. The MPAA blames “human error” for the mixup.It took them 3 years to figure this out? If I do 'human error' stuff like that, the people I know call it 'lying'. If I then use it to try to change the law, as the MPAA did here, everyone I know calls it 'fraud'. As promised in a previous post, here's some artwork from eWorld, an online service we developed during my Apple Era. For context: I was head of R&D for Apple Online Service during this period and these are from a group I ran called CAT (Collaberative Applications and Tools, also know as cool activities and toys). Most of this wasn't used and is concept only. Special 'wow' to Cleo Huggins, who, along with her small interface team, was the primary design thinking behind this artwork and the concept (at Apple) of creating a tiny virtual 2D version of the world online. Well, more accurately, change can be good. As some of you you may know, my day job is running a company called ClickCaster. It's goal was to become the premier podcasting service (create, publish, and find audio and video podcasts) on the web. We built a world class, easy to use and very powerful RSS media platform for the masses. We were early, we had great technology, a excellent team and a popular service. The big issue was answering the question: How do you monitize podcasts? It turns out to be a difficult question to answer. To date, no one's really hit it out of the park. 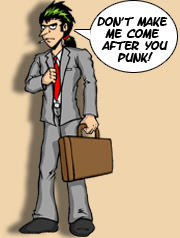 Media 3.0 dude, Shelly Palmer, has two side by side tidbits on his site today. One is how Time Warner is planning to charge for bandwidth. The second is how COMSCORE says video stats are going through the roof. You know you're getting old when someone calls and asks if you'll do an interview for a 'Retro' podcast aimed at Macintosh (and Apple) collectors. I also suggested to James he get in touch with Cleo Huggins, who worked for me and was our primary interface designer for eWorld during the creation phase and he did, indeed, get her to agree and she and I spent an interesting hour recalling some of the old days at Apple and eWorld. 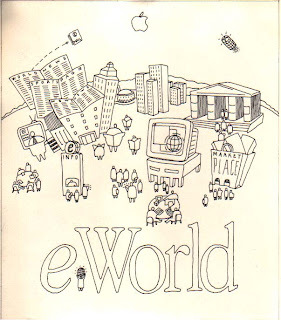 It was about 14 years ago that eWorld was originally announced (1993). Just shortly before Mosaic become Netscape and the internet was (truly) born. Man, talk about lousy timing. Legalese a the end of your email? Think about getting rid of it. I periodically get a sales solicitation from a company trying to sell us something. It's usually a cold call type email to see if we're interested in Indian software development services, CDN's or co-location services. These guys do one thing that really turns me off. This e-mail is intended only for the person or entity to which it is addressed and may contain confidential or privileged material. Any review, retransmission, dissemination or other use of, or taking of any action in reliance upon this information by persons or entities other than the intended recipient is prohibited. Hard to read isn't it? Small type, dim on the page. Doesn't this bug you? Especially if it's from a smaller company (vs., say, AT&T).